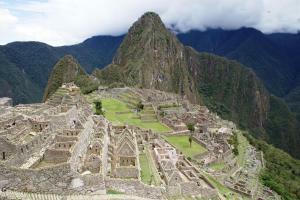 Peru .-officially the Republic of Peru, with its capital Lima city. Is a country in western South America. It is bordered on the north by Ecuador and Colombia, on the east by Brazil, on the southeast by Bolivia, on the south by Chile, and on the west by the Pacific Ocean. is multiethnic, including Amerindians, Europeans, Africans and Asians. The main spoken language is Spanish, although a significant number of Peruvians speak Quechua or other native languages. This mixture of cultural traditions has resulted in a wide diversity of expressions in fields such as art, cuisine, literature, and music.